There are many things that make a webpage load quickly and the most difficult of which is serving static content from a content delivery network or CDN. There are two free CDN that I know of. Coral has other downsides besides speed since it is basically a proxy f0r any website many content filters and security software block the nyud.net domain rendering anything served using Corel inaccessibly. So some users that are behind a company firewall might just see broken jpegs. CloudFlare is a service that just launched in October that provides acceleration and protection for any website by simply changing the name server for the domain. They offer a free service and a pro service but most of the features that would benefit are in the free service, the only major thing it is lacking is SSL support which would be a necessity for any ecommerce site. with just their free service. I have tried CloudFlare with my site anydogbreed.com and have found these numbers to be pretty accurate. They also claim that setup takes about 5 minutes and that is pretty close to how long it took me. First CloudFlare scans your existing DNS configuration and tries to copy it so nothing will change when the name server switches. It lets you review it first and in my case it got everything perfectly. Then it lets you choose which subdomains will be served by CloudFlare and which ones will be sent directly to the origin server. By default the root domain anydogbreed.com and www.anydogbreed.com where setup with CloudFlare and all the others ftp.anydogbreed.com, ssh.anydogbreed.com were set as direct. This was exactly how I wanted it setup so I didn’t have to change a thing. Next I updated my nameserver for the domain at my registrar and then it was done. 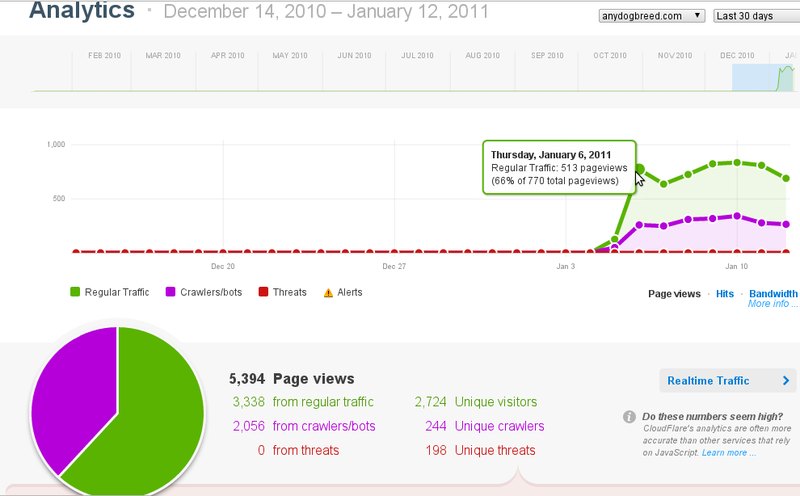 After about a week of using it my traffic hasn’t increased but it hasn’t gone down either. My experience with CloudFlare has been great and I plan on switching my other sites over to it and doing some more benchmarking. Some other reviews on the net have reported problems with reliability and functionality of their sites after switching. Particularly right after updating the DNS the site was unavailable for a few hours. Another user reported problems with their vBulletin forum system after switching. Some users were unable to make new posts. So CloudFlare might not be best for highly dynamic webpages, although they claim their system automatically determines the nature of a page and if it should be cached. Prevents attacks from hackers and spammers. Little control over what gets served by the CDN and what does not. Not good for very dynamic websites. No SSL suppot in free version. It is actually possible to use Google’s powerful server infrastructural for your own CDN using their App Engine that they provide for free. The setup can be a little complex but the speed is unparalleled for a free CDN. where app is the directory holding your application. If I missed a free CDN please let me know in the comments. Also let me know how any of these have worked for you. * Little control over what gets served by the CDN and what does not. * Not good for very dynamic websites. (Dynamic websites aren’t an issue at all because we don’t cache any dynamic content. Updates would occur as normal). * No SSL suppot in free version. We can only resolve the DNS for SSL that we don’t provide directly. You can add the SSL as a subdomain in Settings->DNS settings->Add subdomain->Make sure cloud is gray.